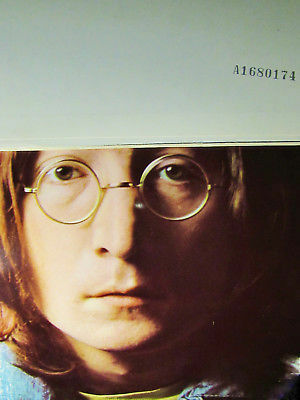 The LEGENDARY WHITE ALBUM, ~ INCLUDES with all inserts as described below! ●CONDITION: the white gatefold cover is rated: a BEAUTY M- TOTAL CLEAN front AND back cover ... hard to find this 50 year old white cover STILL this WHITE = stiff sturdy, and clean condition as usually soils SO easily - again, this cover is WHITE ... No split seams, no bends, no writing, no delete marks ! THE VINYL; both records, all 4 sides are clean HIGHLY GLOSSY M- clean, in actuality expect all 4 sides to play with outstanding - clear audio results! According to the Recording Industry Association of America, The White Album, recorded in 1968, is the Beatles' best-selling album at 19-times platinum and one of the top 10 best sellers ever in the world! Known to everyone as The White Album, this double album is an endless reservoir of great '60s rock music. Paul produced classics such as the rollicking inspired rocker “Back in the U.S.S.R.," the fun sing along “Ob-la-di, Ob-la-da,” the whimsical tale “Rocky Raccoon” (a prime showcase for Paul's storytelling skills), several other simple but pretty pleasures ("Martha My Dear," “Blackbird” “I Will,” “Mother Nature’s Son”) that pointed the way to his more whimsical solo career, a raucous “Birthday” song (with Lennon), and the wildly frenetic “Helter Skelter,” which approached heavy metal and became infamous as one of serial killer Charles Manson’s favorite songs. Lennon was also in fine form, delivering the wonderfully laid-back “Dear Prudence,” the self-referential “Glass Onion,” the darkly moody turned doo-wop inspired “Happiness Is A Warm Gun,” which culminates with a spine-tingling falsetto finish, “I’m So Tired,” on which he sure sounds it (most memorably so), the simple but beautiful ballad “Julia” (his mother’s name, though the song was also dedicated to his new love, the widely detested Yoko Ono), the raw, stoned rocker “Yer Blues,” the equally unadorned and thoroughly crazed “Everybody’s Got Something To Hide Except Me and My Monkey,” and “Revolution 1,” For his part, Harrison wrote “While My Guitar Gently Weeps,” which towers over his three other efforts here (“Long Long Long” is also quite good), topped off by friend Eric Clapton’s monumental guitar solo. Finally, Ringo penned the catchy country/carnival song “Don’t Pass Me By” and sang the lullaby-like album closer, “Good Night.” Some of the songs are infectious and whimsical ("Piggies" has intriguing harpsichord-led verses and a funny chorus) ...of course the acid -illusions and controversial “Revolution 9” is the height of ‘60s self-indulgence. Maybe George Martin (who has a more subtle role this time as the album features more pure Beatles and less studio trickery) had a point when he felt that this should’ve been edited into a single album, but the album's glorious sprawl is also part of what makes it so much fun. After all, ask 100 people to pare this album down to a single cd and odds are that you'll get 100 different answers, and The White Album contains some of The Beatles prettiest and hardest rocking moments on one exemplary package. U2 Boy STILL SEALED original ISLAND LP 1980 perfect!